A restaurant within a former medieval friary is springing into action with the launch of a new spring menu, following its major renovation. Newcastle-based Blackfriars Restaurant and Banquet Hall has unveiled a new menu full of locally-sourced, seasonal dishes, which is guaranteed to put a spring in the step of diners when they encounter the restaurant’s new look. Owner Andy Hook, who has been at the helm of Blackfriars for 15 years, has dedicated the past four months to an ambitious scheme to refurbish the restaurant space and to renovate several empty areas of the historic venue – including the Parlour, library rooms, Smiths Hall, Tanners Guild Rooms and Dormitory Rooms. The new spring menu, devised by head chef Chris Wardale, is the first menu to be served at Blackfriars since the completion of the renovation. Starters include such local specialities as Northumbrian ham, cauliflower cheese balls and hand-dived scallop, or Northumbrian goats’ cheese croquette and potato salad. 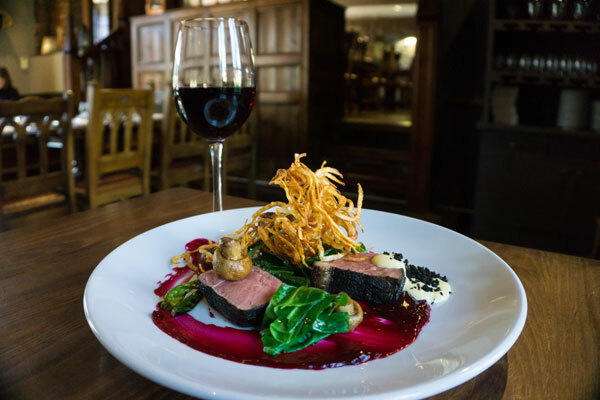 Mains feature hearty British dishes including game pie, creamed potato, young spring vegetables and jus, or ash-rolled beef sirloin, smoked mushroom, spring onions, beetroot and potato hay. Guests can choose from such puddings as refreshing lemon posset, meringue and raspberry sorbet, or indulgent passionfruit cheesecake with passionfruit sorbet. When guests arrive at Blackfriars, they can now relax in The Parlour Bar next to the restaurant, which was originally the heated waiting room for visitors to Blackfriars. Other renovations include the rooms above the restaurant, which were formerly the libraries for the Dominican Friars, and now form a larger Workshop space. The Smiths Hall, located directly above the restaurant, is set to form part of a public exhibition, and the upstairs Tanners Guild Tasting Rooms, which was once used by the Tanners Guild, will cater for a range of corporate and private events.